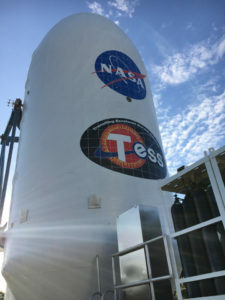 Meteorologists with the U.S. Air Force 45th Space Wing continue to predict an 80 percent chance of favorable weather for liftoff of the SpaceX Falcon 9 rocket with NASA’s Transiting Exoplanet Survey Satellite (TESS). Launch is scheduled for April 16 at 6:32 p.m. EDT on a SpaceX Falcon 9 rocket, from Space Launch Complex 40 at Cape Canaveral Air Force Station in Florida. On launch day, the primary weather concern are strong winds.